Presenting: Nightmare Noir! And Giveaways! 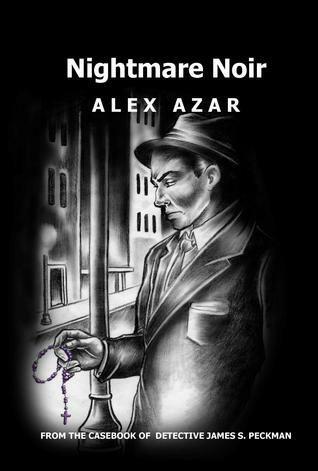 We are proud to present our second single-artist collection, Nightmare Noir by Alex Azar. Alex's work previously appeared in Strangely Funny and The Undead of Winter. Detective James S. Peckman was introduced to our readers in Undead; fans will be pleased by this casebook of his investigations. Nightmare Noir is now available for preorder (domestic only). The cover was done by TJ Halvorsen, a talented artist in St. Petersburg. He has worked for many of the major comic companies as a penciler, inker and background artist. TJ attended the Joe Kubert School for Cartoon and Graphic Design and earned his Associate's Degree in Graphic Design from the University of Colorado. The artwork is based on a much older piece of art that wasn't for a book. Can you guess which one? We're giving away one book on Goodreads, but we're also giving away two other copies to readers who comment on our blog and the other pages participating in the reveal. This list may change over the weekend, so check back. Each comment on a new blog is another entry for the drawings!